Through their admirable energy, dedication, and leadership, religious board members sustain our world's most invaluableorganizations. This in-depth handbook offers essential insightsfrom respected veterans of religious and nonprofit work ongoverning an organization with a religious mission. Drawing onyears of research, consulting, and hands-on religious nonprofitwork, the authors show how board members can clearly define theirroles and mission, transform hierarchical structures into models ofcollaborative leadership, and organize for greater impact. 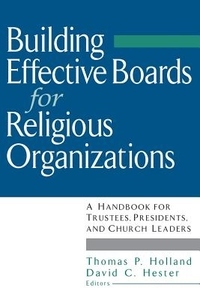 From congregations and seminaries to soup kitchens, hospitalchains, and social service agencies, Building Effective Boards forReligious Organizations examines both the nature and nurture ofreligious boards. Interfaith in scope and brimming with real-lifeexamples, it skillfully demonstrates how a religious board canescape common problems, and how understanding the full depth of theorganization's mission can help it best fulfill its intendedpurpose.